It’s no secret that here at Red Candy we have a BIG soft spot for quirky animal-shaped products! And, if our best-sellers list is anything to go by, our customers do too! With this in mind, we’ve put together this super cute collection for anyone who is buying a festive treat for animal lovers, and crazy cat women in the making (we’re looking at our Marketing Manager, Rachel)! From giraffe-shaped toothbrush holders to elephant-shaped cutlery drainers, our top animal-shaped products would make wonderful gifts for animal lovers, and also anyone who has a penchant for quirky design and talking point accessories! See all of our Gifts for Animal Lovers here, and keep an eye on our blog over the next week for a new gift guide per day! Coming up: coffee and tea lovers and gifts for gardeners! 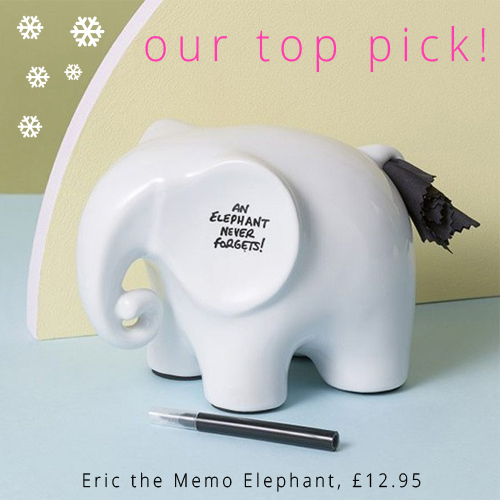 If you’re buying for an animal loving friend or family member who’s a tad forgetful, then the Eric the Memo Elephant would be the perfect gift for them! The phrase ‘elephants never forget’ has never been more true with this adorable ceramic elephant – you can write memos all over him so even if you do forget that important message, you can be safe in the knowledge that Eric won’t!